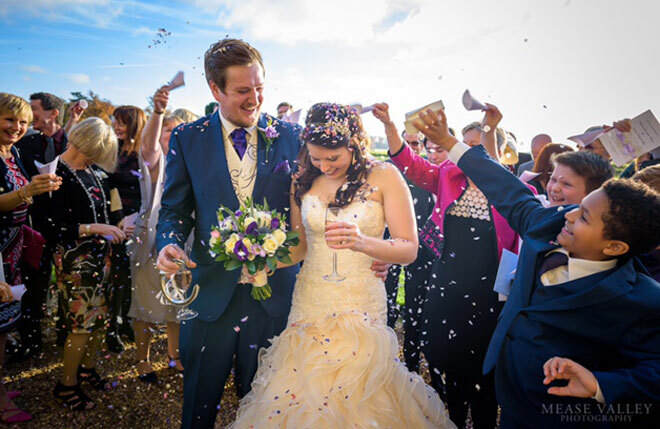 You might be forgiven for not believing this is a Winter wedding as the sun shone gloriously throughout the day. It really was a wedding at the end of November. It’s amazing really but some of our Winter brides can get lucky with the weather and have a sunnier day than those in the middle of summer. 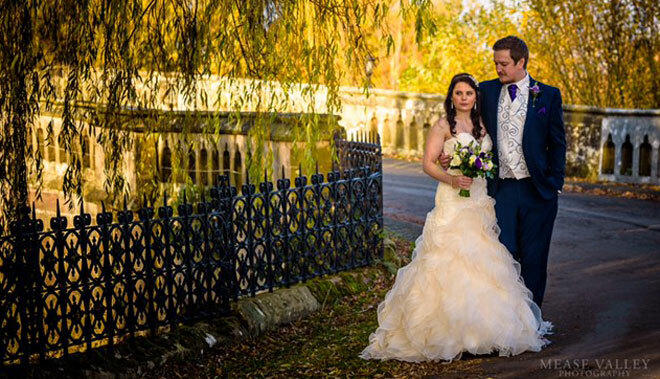 Heather and Jordan certainly made the most of the sunshine and enjoyed the grounds at Walton Hall Hotel to capture some special moments. 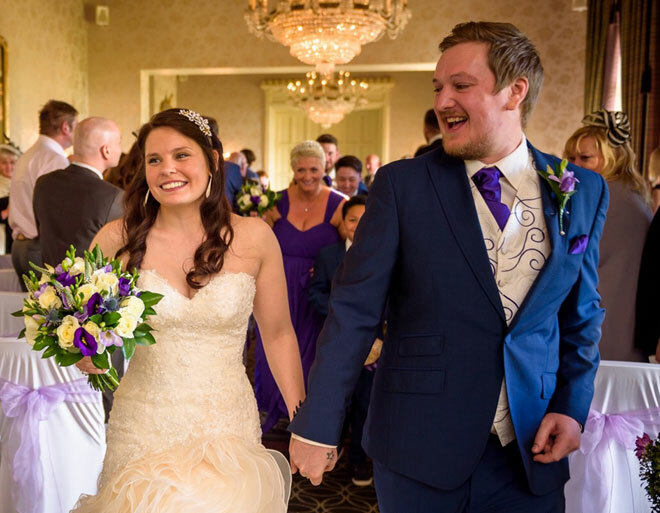 I was really delighted when they sent me through these beautiful images from the professional photographer. Christmas can be a really romantic time of the year to get married and this couple were full of romance. 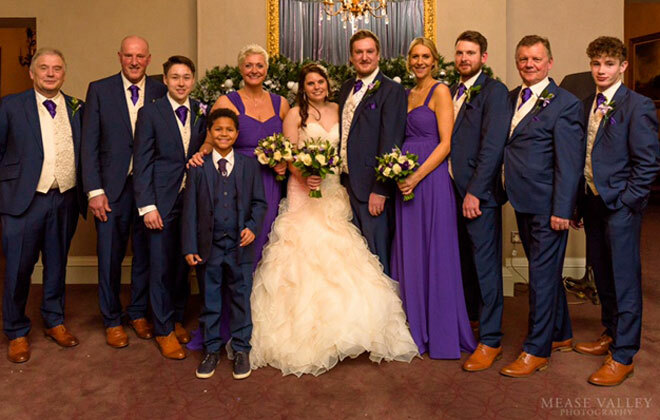 I met them several times at the Walton Hall Wedding Fairs and they always looked like they were enjoying every aspect of wedding planning. I think that’s when they saw an example of one of my table arrangements that they fell in love with. You can see it here created in their ivory and purple colour theme. Tall wedding centrepieces work really well in the Moncreif room as it has such high ornate ceilings. 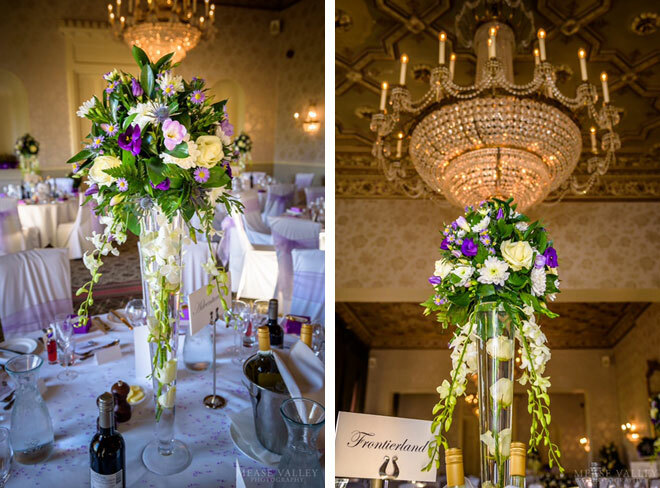 Our tall centrepieces are created so that they don’t obstruct the view across the table. 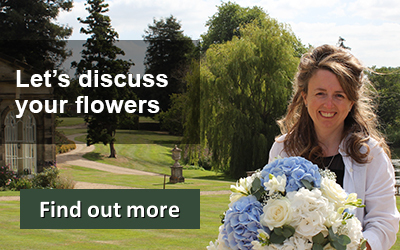 Heather wanted all of her wedding flowers to have a natural look so I incorporated lots of dark green foliages into the arrangements. Ivory ‘Avalanche’ roses were submerged in our tall cone vases to give an extra wow factor. 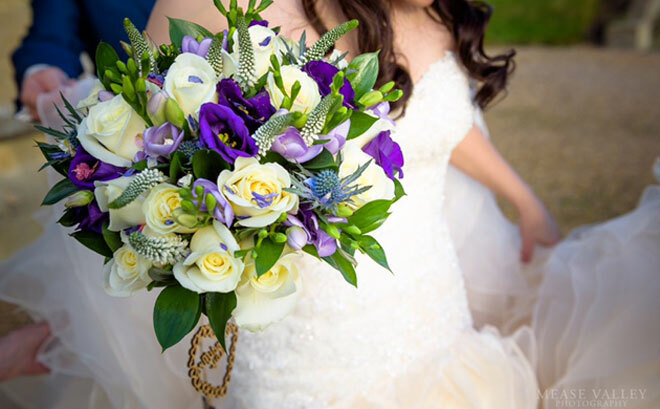 Heather’s bouquet was a natural loose mix of ivory roses, lilac freesias, purple lisinathus, white veronica and blue thistle. By using different sizes and textures of flowers and foliage I can create bouquets that have this beautiful handpicked natural look. For Heather’s bridesmaids I made posy bouquets that were very similar to the bridal bouquet but smaller in size. I didn’t add the veronica or thistle so that they were slightly different. You can also see (above) this happy page boy who is about to scatter petals down the aisle. 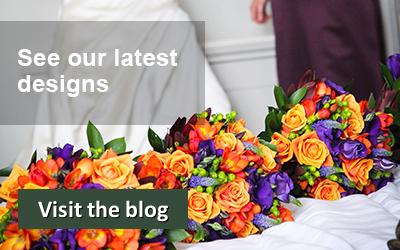 Heather and Jordan went to a lot of trouble to coordinate all the aspects of their wedding. 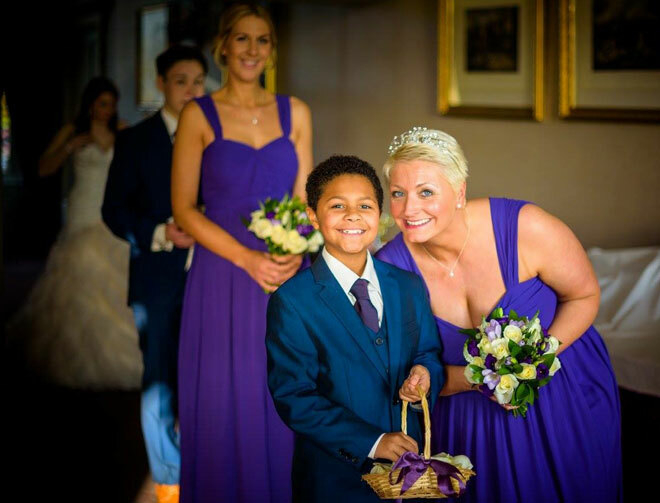 They very successfully incorporated the purple wedding colour theme through the flowers, bridesmaids’ dresses and gents’ accessories. 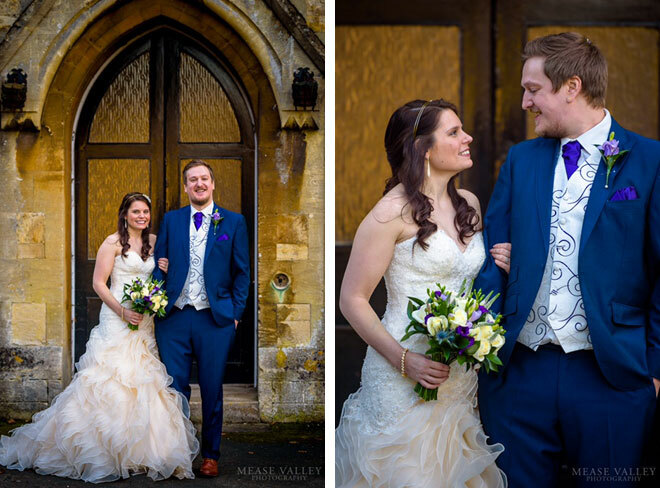 It was a complete pleasure working on this wedding and I’m delighted to be able to share these very special photos with you.